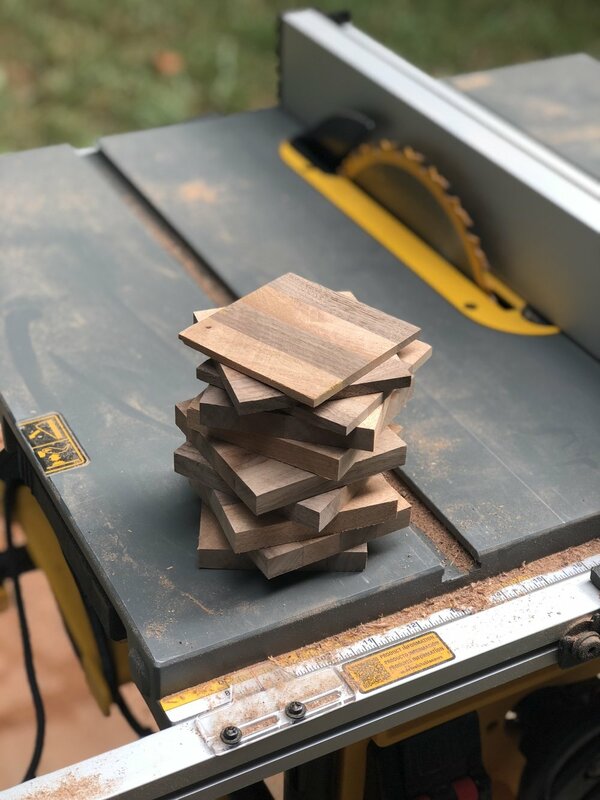 Ever since the Instagram Builder's Mini Challenge 2 - to build a cutting board - I have fallen in love with cutting boards and the challenge of designing them and creating them with beautiful, rich hardwoods. I found myself with leftover scraps of walnut that I wanted to continue using, but wasn’t sure what to do with them. Last week, I saw a post from DIY Huntress, who participated in a scrap wood challenge and she made the most beautiful coasters! This was it! My scrap wood dreams come true! This was seriously the simplest project and used some pretty basic tools - I used my table saw and an orbital sander, but you could probably use a miter saw for the whole project, if you don't have a table saw. If you want to create your own, Sam has both a blog post and YouTube tutorial, depending how you want to follow along with her. Post glue-up, I cut my blocks to 3 ¼” x 3 ¼” - you can see the end piece of the random scraps in the background! Before cutting board oil... posing with the cutting boards I used the scraps from. The technicalities: I used some leftover walnut and mahogany I had in my shop. I glued four 1" thick pieces together with Titebond III (food safe) and clamped overnight with my Bessey pipe clamps. Sam (DIY Huntress) cut her slices on the table saw first, then trimmed into squares with her miter saw, but I cut mine into 3 1/4" square blocks first, then sliced into 1/2" slices with my Dewalt table saw. I did end up with a couple smaller slices that were the end of the blocks. I used Gator Finishing 80, 120, and 220 grit sanding discs on my Dewalt orbital sander to finish my coasters. Once they were nice and smooth, I finished with a coat of Howard Products Mineral Oil.